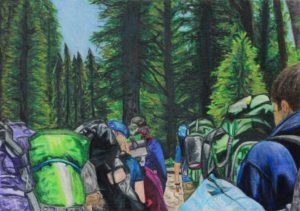 The AP Drawing Portfolio is an intensive course, requiring students to produce art at the college level. Students compile a portfolio of 24-29 original artworks demonstrating mastery in composition, technique, and concept. Twelve of those pieces explore a common idea, called a concentration. Students create an artist statement that describes and explains their body of work by answering the following questions. 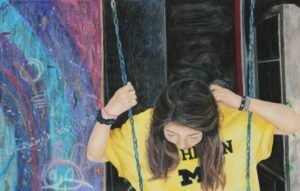 Be sure to come to the opening of the AP Art Portfolio Show, April 25, at 6:00 p.m. before the Choral Concert. 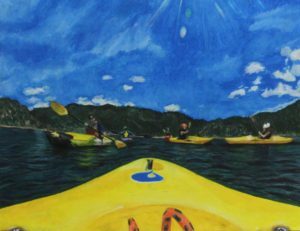 Juliana DiFilippo has been in the ESJ Visual Art Program since seventh grade, and her work continues to be enjoyed by the community. Juliana, what is the central idea of your concentration? The central idea of my concentration is to explore the connection between emotions and the outside world. In today’s society, people get too involved with materialistic objects like phones and clothes, and they often are blinded by the facade of social media and the appearance of being perfect through the works of Photoshop. One of my great passions is exploring outdoors and getting away from those things that can take away or distract me from being truly happy. For my portfolio, I decided to use my own pictures that I took from some of the purest moments of happiness I experienced through my travels with friends and family. Each picture shows nature in its true beauty, while also capturing the emotions of the people in them. The people are never staged for the photo, but instead, I took them when they didn’t realize a picture was being taken of them. I decided to use their pictures of them while they are in their naturalist form to reflect with the nature in the background. How does the work in your concentration demonstrate the exploration of your idea? In the artwork, I start with the original picture, I rarely crop them and never use photoshop. I use mediums such as oil pastel, paint, and colored pencils to create colors that are vibrant and bold. These colors are to represent the joy and radiant feeling that one gets when seeing these breathtaking places. The majority of my work demonstrates a tie with the different tones of greens and blues. I like to focus on the small aspects of my art in order to capture even the smallest of detail. I focus on details because sometimes it is the smallest things that can make a difference or make one happy. Each detail in nature works together to make its own masterpiece and I took that inspiration to make each piece of art. In one of my favorites, a little girl is sliding down a blue slide. 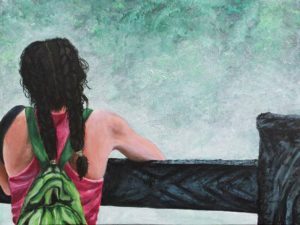 I painted this piece and chose this picture because when we are younger we are full of life and unaffected by the world. She still loves being outside and playing on playgrounds, and she represents the child in everyone that we no longer have the chance to be. How has your idea changed/developed since the beginning of the year? My idea has changed a lot over the year. I originally only created my art on pictures I liked. At first, I didn’t realize a connection in my work, but after a while I could see a pattern forming. I thought I was just going to create my concentration based on nature and our environment, but eventually, I saw that there was so much more to it. I chose to paint or draw certain things based on my emotions and how those captured moments made me feel. I have always enjoyed using bright and rich colors, so my art all included those things. Over time, and as a I have gotten older, I have realized my passions and my priorities. I know what’s important to me and where I should place my happiness.